My Rimmel London 60 second nail polish collection is not very big, I have many other nail polishes but I am not faithful to one brand. 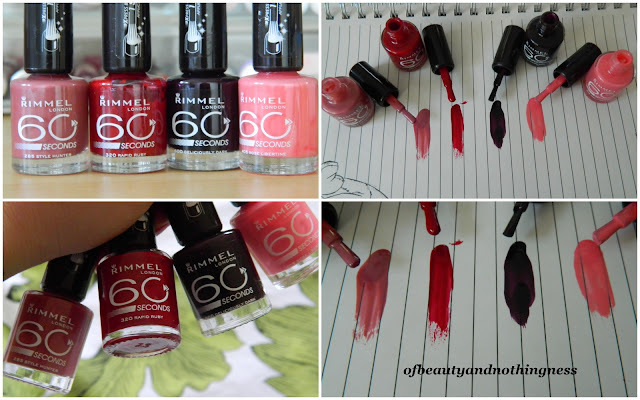 Here are the swatches and mini reviews of the Rimmel 60 second nail polishes that I have. All swatches show are just one coat with no top coat. Firstly, 320 Rapid Ruby. 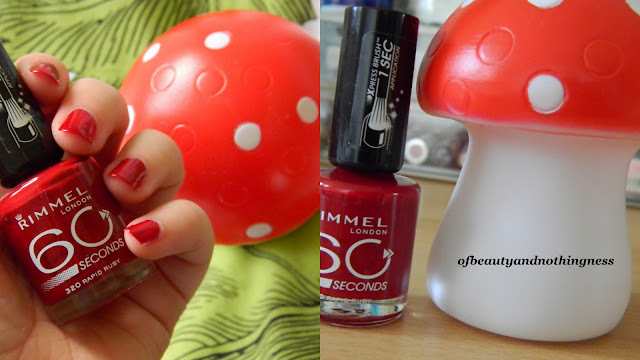 I love a good red nail polish (my favourite red is from Bourjois but it chips like nothing else). I love the bright red (almost orange red) shade of this polish and it applies really nicely. This shade is not streaky and with a good top coat (such as the infamous Seche Vite quick dry top coat) this polish lasts for a couple of days on me before wearing at the tips of my nails. Overall, the longevity of this shade is good but not great as it only lasts for me for about five days before chipping and it would show definite wear at the tips after five days. Secondly, 285 Style Hunter. I bought this shade from asos, so I didn't see it in person and if I saw this shade in a store I may have bough it. Although unfortunately this shade looks nicer in the bottle than it does on my nails. 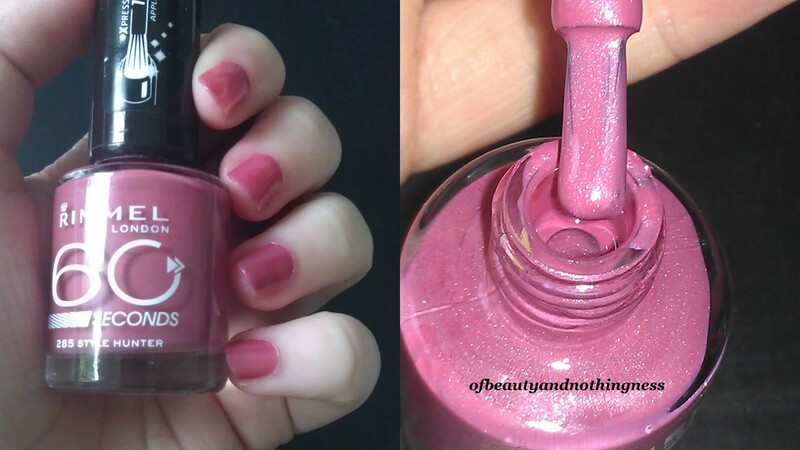 This shade is very generic and unoriginal in my opinion and it is a little bit too girly for me as it does have shimmer in it which is not massively noticeable in the bottle. Overall, this shade applies nicely, it is not very streaky and it has good longevity - five to six days before I have to remove it. Thirdly, 600 Deliciously Dark. This shade looks nice in the bottle but on the nails it is incredibly streaky - one of the streakiest nail polishes I own. The streakiness is a major negative point against this product but it does dry quickly (as do most of the other 60 second polishes). Overall, this polish is very streaky, it dries quickly and it has average longevity (about three days before chipping and wearing at the tips). Lastly, 405 Rose Libertine. This shade is currently a free product when you buy something from the Rimmel Facebook store. I bought this shade from Asos and if I saw it in a store I wouldn't have bough it. This shade is too light and girly for me! Although despite the barbie look of this polish it actually applies nicely, it dries fairly quickly and it is not streaky, in my opinion. 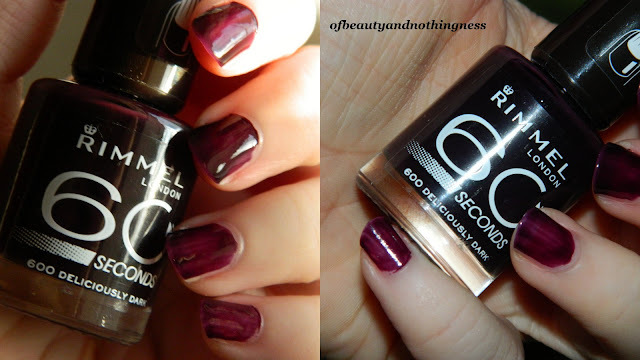 Overall, a great polish with good longevity but the shade is not really for me.